It is estimated that at least 80% of FH cases in Australia are currently undiagnosed and less than 10% are being adequately treated. Early detection and treatment of individuals with FH can delay or prevent the onset of CHD. Owing to the inheritance pattern of FH, the identification of a single, confirmed case of FH indicates potential new cases in the extended family. For each affected individual, at least one of their parents will be affected, as will ~ 50% of their children and ~ 50% of their siblings. The pedigree can then be further extended from any of these affected individuals. This approach is termed ‘cascade-screening’. The implementation of a similar program in the Netherlands identified an average of eight affected family members for every index case which presented. 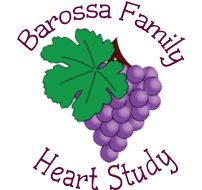 What is the Barossa Family Heart Study? If FH is detected then immediate family members are contacted to undergo the same procedure. This is called cascade family screening. In the longer term (2013-2015): it is intended to carry out a pilot FH cascade family screening (CFS) programme specifically designed for general practice. CFS is the most cost-effective means to identify affected relatives of an initial case. Early identification of FH allows early and effective treatment with statins to lower cholesterol levels, thereby improving life expectancy and reducing the burden of cardiovascular disease. The usefulness and potential applicability this program to other centres in Australia will be investigated. Children over the age of five years and adolescents will be offered screening for FH. Children under the age of five can be screened where a strong desire is indicated by parents or, FH is suspected. Management varies according to the level of risk of FH. All patients should receive information on healthy diet, anti-smoking, exercise, family support and medication adherence. Non-cholesterol risk factors such as obesity, hypertension, diabetes and smoking should be treated in all patients. Lifestyle modifications alone may be a sufficient intervention for the larger proportion of younger children or those with lower risk FH.